Christina is angling for Paul to take her out to a business dinner. Unbeknownst to her, Eddie has already told Paul that he plans to invite Christina out to a disco that evening. Madge is looking at a painting. She doesn't like, it so she's relieved to hear that it's not one of Helen's paintings - she only bought them for the frames. Madge invites Helen over for dinner tonight, but she's already booked up - Dorothy is taking her to a Vivaldi concert. Helen invites Madge and Harold along, but she says it's not her style. 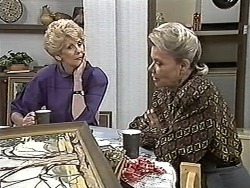 They chat about Jim and Beverly's relationship and Helen is fervently hoping that they will patch things up. 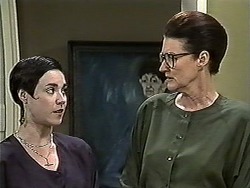 Madge thinks it's silly making Todd live in the flat behind the surgery - there's a lot more room at the Robinson house. They also talk about Toby - it seems that Joe is bringing Toby back from Darwin today. Also, Nolene's body will be brought back and the funeral will be held in Erinsborough. Joe has arrived back. He hugs Kerry and tells her that Toby isn't very good. He comes in, head down, looking very depressed. Kerry hugs him but he is very unresponsive. He goes off to put his bag in his bedroom. JOE: He's been like that ever since I got to Darwin, hardly says a work. I don't know what say, I don't know what to do, you know? I mean, nothing's going to bring his mum back. KERRY: Give him time. He's still in shock. The most important thing is that we're here for him when he needs us. Melanie can hear Harold's singing from across the street. She is listening intently and admiring his voice. She tells Dorothy that she's been disagnosed tone-deaf. Dorothy thinks that's rubbish - everyone can get there through hard work. She knew someone like Melanie who worked hard and now she sings with the Australian Opera Company! Eddie storms in and invites Christina to a disco tonight. Melanie is raving about Harold's singing and how lovely it was. She feels sad that she's such a bad singer herself. But Melanie says that she might be able to sing with hard work - Dorothy said so. Sharon tells Harold that the stuff he sings is prehistoric! Melanie asks Harold to give her some singing lessons. Harold is takenaback and says he's not a singer. MELANIE: Oh, Mr Bishop, you're the only person who can help me. Harold agrees and suggests they start off with "Twinkle Twinkle Little Star". Melanie's singing is excruciating and Harold's face is a picture. Madge and Sharon have retired outside and stuffed paper in their ears to get away from Melanie's singing(!) They turn to scales, and over at No.32, Bouncer starts to wail. 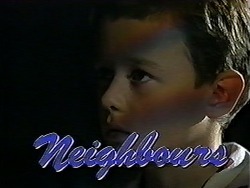 Joe brings Bouncer in to see Toby. He doesn't want to give him a pat and just sits there blankly. Kerry comes in and says she's laid out some clothes on Toby's bed for the funeral. Joe is desperately worried about him. JOE: I don't know what to do. He's breaking my heart. Dorothy comes round to ask if they want her to make alternative arrangements for Lochy's babysitting next week. But Kerry says that it'll be good for Toby to have someone his own age around. Caroline is about to go out and Paul is ready for his dinner too. There's a knock at the door and it's Cathy. Christina glowers at her. When Paul and Cathy have left, Christina says that Cathy is blatantly not Paul's type - they look weird together. Kerry, Joe and Toby are back from the funeral. It was pretty hard and Toby looks very drained. He doesn't want a sandwich and goes off to his room. Apparently he didn't even react at the funeral. Joe is terribly upset that he can't reach Toby. He doesn't know what it'll take for Toby to snap out of it. Paul and Caroline are back from their respective evening engagements. Paul had a good time with Cathy, saying she was a bit of a dark horse - she turned out to be really witty and intelligent! Christina and Eddie come in from their disco have had a great night dancing. Melanie gargles and then starts singing "When The Saints Go Marching In" very tunelessly. She turns on a microphone and then sings down it. Dorothy and Helen hear Melanie's singing next-door and Dorothy wishes she hadn't encouraged her now(!) Dorothy and Helen have had a good time at the concert - Helen doesn't get out much these days. 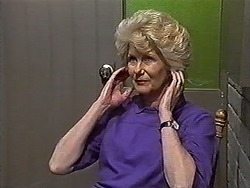 They talk about their lack of love lives and Dorothy mentions that it's twelve years since she and her husband parted. HAROLD: Ohhh, I've created a monster. MADGE: Well, Dr Frankenstein, I suggest that you un-create it! Eddie and Christina are chatting. He asks about Christina's love life and she says she hasn't been seeing anyone for a while. Eddie had someone in England, but it's ancient history now. Eventually they managed get out the words that they each want to be friends - they don't want anything more. They laugh. Kerry wakes with a jump to find Toby standing over her. He is apparently sleep-walking. But Toby's eyes are vacant. KERRY: Joe. Joe, wake up.